Having put my game to test—often with less than stellar results—over hundreds of different courses the opportunity to play the Tom Fazio-designed Shadow Creek, a course with almost mythic reputation, I knew was going to be really special. It’s exclusive, expensive, intimidating and perhaps above all beautiful, singing a siren song impossible to resist. Built 25 years ago for the then astonishing figure of $47 million, casino magnate Steve Wynn wanted a golf course for the rich and famous visiting his Las Vegas gaming and hotel properties. Beyond a doubt Fazio and Wynn succeeded with Shadow Creek annually ranked among the very best but also they achieved something much more important. 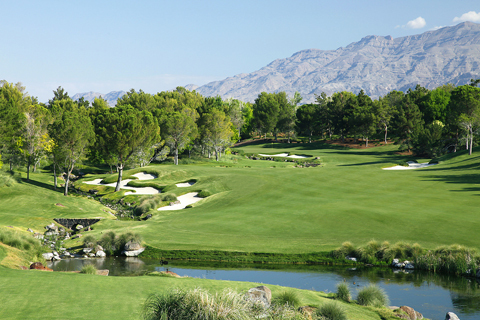 The course receives rave reviews from players. Having that in mind our Shadow Creek experience began with a 25 minute ride from our hotel, the new and posh Delano Las Vegas and on the way we were treated to an Air Force B-1B bomber low level fly-by–Nellis Air Force Base is located just to the east—which all-in-all is not a bad way to start the day. When first opened Shadow Creek was all but impossible to get on without Wynn’s personal approval. That has changed now MGM Resorts International is the owner having purchased the course along with several other Wynn properties. Those staying at one of MGM’s 13 hotels on the Strip (among them Bellagio, The Mirage, Mandalay Bay and the Delano) may book a tee time on Monday through Thursday for a $500 fee which includes a limousine to and from your hotel, a golf cart and caddy–though not the caddy’s tip. After all the buildup then the question was, “does Shadow Creek live up to its reputation?”, and in one word the answer is an emphatic yes. First of all it is long stretching to 7,560-yards and very demanding calling for shots both from the tees and into the greens having length and precision, but when you reach the green the fun really begins. The putting surfaces have large sweeping contours and are kept very quick making them a real test, a test one probably none of us could hope to pass without reads from a knowledgeable caddy. Each visitor of course comes away with his own impressions and memories and mine, aside from recalling specific shots hit on particular holes, include not seeing other golfers during our round except occasional glimpses of the foursome ahead of us. Rarely was an adjacent hole visible and perhaps most astonishing not a single weed in the rough, in the fairway…anywhere. Saying golf at Shadow Creek is unique is a gross understatement. Fazio moved immense amounts of soil creating his layout and by nestling holes between gently rising hillsides forested with transplanted trees each seems to exist in its own little valley. Describing individual holes will invariably be inadequate because the course is so visually stunning with the entire layout framed by the dull gray of the Nevada mountains on the skyline. However, let me give you an idea by with just one hole, the par-3 17th. It’s not overly long—we played it from 147-yards—but the combination of a steep hillside impinging from the right and a waterfall backdrop to the green not to mention the small pond in front, makes for a very intimidating tee shot even for accomplished players. 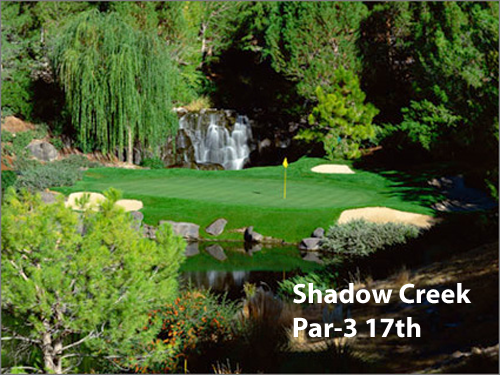 And Shadow Creek’s other 17 holes are equally impressive experiences. Mark Brenneman, General Manager and PGA Professional, is a most personable host and as could be expected his staff is knowledgeable, helpful and efficient. In 2009 greens and tees were rebuilt by Fazio and as a nice touch, the project included a new short game area mimicing the greenside challenges found on the course. Perhaps the most ironic thing though is should you be fortunate to experience Shadow Creek your score after taking on one of the toughest courses you will ever play can’t be posted for your handicap. Shadow Creek has not allowed the USGA to rate the course.